Protecting the strategically important Ham sewer in London’s east end from Crossrail’s two 7.1m diameter Tunnelling Boring Machines (TBMs) led to the completion of a unique civil engineering project earlier this year. In what is believed to be the closest pass by a large diameter TBM to a major sewer at just 500mm led to an innovative project response from an alliance of partners. The complex 20-day project (with associated works spread over a number of months) saw a 50 metre continuous duplex stainless steel structural lining jacked into place within the existing 2.06 diameter sewer and precision welded to standards normally associated with very high pressure pipelines. UKDN Waterflow worked with the Dragados Sisk Joint Venture (DSJV) and Thames Water on behalf of Crossrail on this project, with engineers Fairhurst providing consultancy services. Engineers working on behalf of Crossrail searched for examples of protection works for this type of issue and found that, of twenty five projects worldwide, none came anywhere near such limited parameters. This was by far the closest pass by a tunnel to such a major and sensitive structure. Various ideas were considered and rejected, including using a huge Ultra violet cured GRP liner, before UKDN Waterflow were approached to submit a design that met the stringent technical and regulatory conditions needed for this project to be successful. Precision surveys of the sewer using laser burst technology by UKDN Waterflow were passed to engineers Fairhurst, who helped turn UKDN Waterflow’s design into a workable technical solution. Ground movements along the sewer had been previously assessed based upon empirical methods and this had led to the conclusion that there was a high likelihood that ground movements would damage the masonry sewer wall. To design the steel lining and to determine the effects of lining stiffness on ground movements, longitudinal deformations were modelled under a 2D FE analysis. Ground movements were initially calculated assuming a zero tunnel stiffness with a 1% tunnelling volume loss. Ground movements were then re-calculated with the stiffness of the steel lining input as a beam strip. These results were then used to proportion the predicted empirical ground movements to determine the effects of the continuous steel lining on overall settlements. Once the settlement had been assessed, the lining was modelled as a beam element with a deflected shape to match predicted deformation. The induced bending moment was used to calculate bending stresses within the lining. Circumferential bending was also considered using predicted settlements at the crown and invert of the sewer and modelling this as an imposed distortion to the tunnel lining. Global buckling of the lining shell was considered assuming that the lining is mostly supported by the surrounding ground and that any loss of support will be local only. The effects of local buckling was also assessed by considering the critical theoretical stress at which buckling of the liner would occur. The design for the 50 metre long continuous structural steel lining was subject to a full independent Category 3 design check and acceptance by Crossrail and Thames Water experts. To satisfy Thames Water’s concerns on the durability of the lining, it was decided to construct the lining in stainless steel plate. To resist the stresses induced by predicted deformations a high strength Duplex stainless steel was used. The Duplex stainless steel was flown in from both Italy and America, making this a truly worldwide solution. A temporary works design was put forward by UKDN Waterflow and initial work included reinforcement of the HAM sewer with a temporary protective metal and rubber installation support cage. This enabled the creation of two shafts, one for over-pumping of wastewater from the Ham to the adjacent Wick sewer, and the other as an access shaft within which the huge steel liners could be lowered. The temporary liners protected the sewer as massive sheet piling girders made safe the access and over-pumping shafts. DSJV sheet piled both shafts using a Giken silent piling rig to avoid damage to surrounding buildings and a nearby retaining wall prior to excavation of the 10m x 6.8m x 13m deep drive shaft and 8m x 6.8m x 16m deep over pumping shaft. 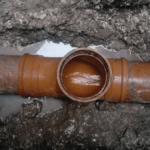 UKDN Waterflow suggested over pumping the dry weather flow from the Ham sewer to the nearby Wick sewer during the whole works. To enable this to happen a new weir and penstock valve design blocked the flow, diverting it into the pump chamber. Here six 300mm pumps accommodated a total dry weather sewer flow of 2000 litres a second, pumping wastewater up the 14 metre shaft into the adjoining Wick sewer. In all three generators provided 1.2 megawatts to keep the pumping going around the clock. During peak flows of up to 8000 litres per second the penstock had to be raised to permit the storm flow to pass through the work site. Upstream monitoring, traffic light evacuation procedures, and alarm warnings were established and tested many times during the works, with no single accident on site. The complex site also housed construction teams from Murphy, who were simultaneously diverting mains water pipes similarly affected by the tunnel boring works meaning the project working conditions were very tight. The site being squeezed between the dual carriageway approach to the Blackwall tunnel one side, and housing on the other, meant that some of the manholes used for this project were located either on the carriageway or within the central reservation, making access an issue. 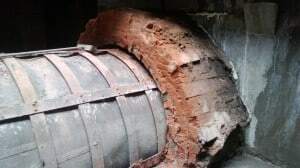 The opening between the liner and the existing brick was then grouted through preformed grout holes using cementitious grout, to ensure there were no voids and that the loads from the TBM works are transferred onto the new structural lining. A 450mm lateral connection was reconnected with a 500kilo, 20mm thick reinforcing plate site welded in-situ to distribute the load. Stakeholder and environmental management was a key factor on the project, with residential housing less than five metres away from the main shaft. The site was therefore protected by Haki temporary shelters and Soundex Acoustic curtains to minimise odours and noise for local residents. Jon Hynes Crossrail Contract 305 – Eastern Running Tunnels , DSJV further commented: “To install 50 tonnes of 50m long duplex stainless steel liner into a live sewer, 10m below ground, and 500mm above the Crossrail running tunnels sums up the complex nature of the task that faced Dragados-Sisk JV and UKDN Waterflow nicely. However, it belies the extent of the consultation, interface and design progression that all partners embarked on a full 18 months before the first liner sections arrived on site. From conception, it was clear that numerous parties had ‘a stake in this game’; from residents to asset owners, from the Project Manager to various designers, and from consultants to contractors. In addition, to keep us all on our toes, we had the Drive Z TBM launching from the Pudding Mill Lane Portal some 100m east of us. In other words, no liner………no launch! The first Tunnel Boring Machine successfully passed the reinforced section in August 2013 without incident – The second TBM is due to pass in 2014. With no injuries and a 100% safety record UKDN Waterflow’s highly skilled team’s work on this site will continue until 2015 when the shafts will be reinstated, most recently the team have inserted a Ultra Violet cured GRP liner into the adjacent Wick sewer to provide additional protection. As this 1.2m diameter sewer is slightly smaller and that bit further away from the tunnelling works a GRP lining could be used. UKDN Waterflow teams continue to deliver agile and ground-breaking stabilisation programmes at Crossrail sites throughout London.